If you have already rented from The Margarita Man, you know what a great service it is. We are currently in the process of offering distributorships in New Jersey. We would like to introduce this great opportunity to you. If you have enjoyed our service and award winning mix, I'm sure you will agree it's an excellent opportunity. This is an easy way to own your own business or just to make some extra income on the weekends. One of the many advantages of this business is it can be operated from your home. It's also great to have access to the machines for your own parties as well as for family, friends and office functions. And don't forget chirldren's parties with slushy flavors available like Tropical Punch, Blue Raspberry, Summertime Lemonade and Watermelon. Not only are the machines great for party rentals but you can also participate in fairs, carnivals, arts & crafts shows, fund raisers and festivals year round. We also get many week day rentals. It's up to you! Pick and choose which rentals work for you. 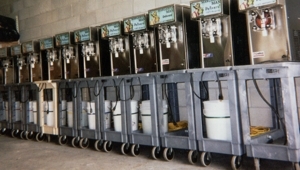 The Margarita Man has over eighty independentaly owned and operated locations in 30-states across America. New Jersey Counties still available are: Sussex, Warren, Hunterdon, Passaic, Hudson and Essex. Call 800-950-8149 today. Or email margaritaman@gvtc.com. Reasonable one time franchise fee and NO ROYALTIES! We now have a network of Margarita Men in NJ. To date that's over 100 machines in NJ and growing! As a network, we help each other out with rentals if short on machines and share our marketing and advertising ideas. You would also receive any waiting list customers from neighboring counties if needed. The larger we become, the more name recognition The Margarita Man receives. Would you like to speak with some of our distributors in New Jersey? About 90% of all our customers say what a great idea The Margarita Man is and they wished they had thought of it. Now's your chance! For further information, call Laurent Perron toll free at 800-950-8149.